← TBS6 [P3] Rey's Speeder (Jakku) Now $14.99 Prime On Amazon! Like many of you, I remember scouring garage sales for Star Wars figures that parents were selling for .25 cents or 5 for a buck. It seems like with all the technology at your finger tips, the days of finding that gem cheap is over (or at least more difficult). 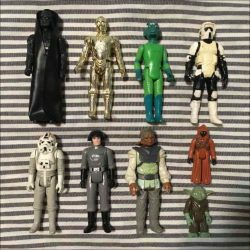 Well, I had this app on my phone for quite awhile and I mostly used it to sell some old clothes and things, but recently I find out it can be a treasure trove for Star Wars collectors. Click through to find out more. TBS6 Below MSRP Almost Everywhere Now - What's Going On?